Available - You’re ready to accept incoming chats. You’ll appear as available to chat with customers in Beacon. Assign Only - You’re not ready to accept new chats, but your teammates can assign ongoing chats to you. 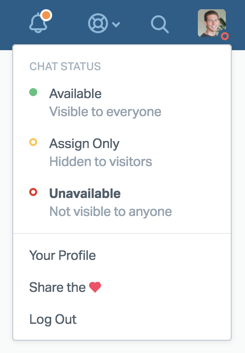 Unavailable - You don’t appear in Beacon, and you cannot take on new or assigned chats. If a User is inactive or exits Help Scout, their status will automatically change to Unavailable. If you are logged into the Help Scout web app in any open web browser and set to Available, you are being presented as available for chat. If you log out, close your web browser, or put your computer to sleep, you will be automatically set to Unavailable. Note: A chat will be considered missed after 5 minutes if it is not accepted by an Available User, or if user availability has changed since the chat was created. In those instances, the chat messages the customer sent will be converted to a chat transcript and will be available for follow up in your Unassigned folder. Any Help Scout users who were set as Available when a missed chat occurs will be set to Assign Only with a notice on their Help Scout session. The Maximum Chat setting defines how many chats you can handle at once. When you reach or exceed this number of chats, Help Scout will automatically change your status to Assign Only. The Maximum Chat value represents total chats across all mailboxes. The default value is set at 3. We think 3-6 is a good number to help prevent customers from waiting, but pick a number that works for you and your team. 0 isn’t a supported value. If you want to turn off chat, set yourself to Unavailable. Head over to your Profile page to update your Maximum Chat setting.